To be honest, when we started this “upcycle” we really didn’t know where it was heading but as it came together we could see some of our favourite things evolving out of the mist. 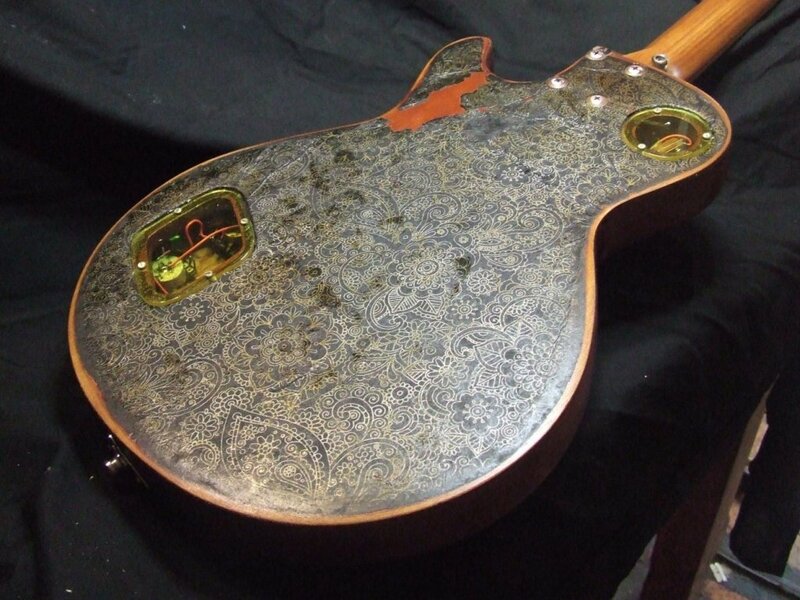 But first the back story… This guitar was donated to us some years ago. She was in a sorry state, just the bare bones comprising of the body and the neck. 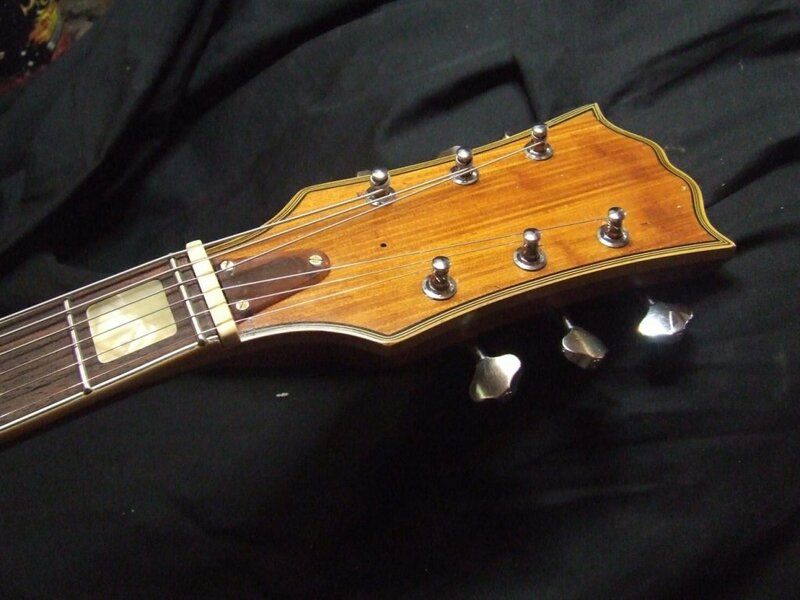 The finish had been stripped and the headstock binding was missing as were pieces of the headstock and there it sat for at least three years. 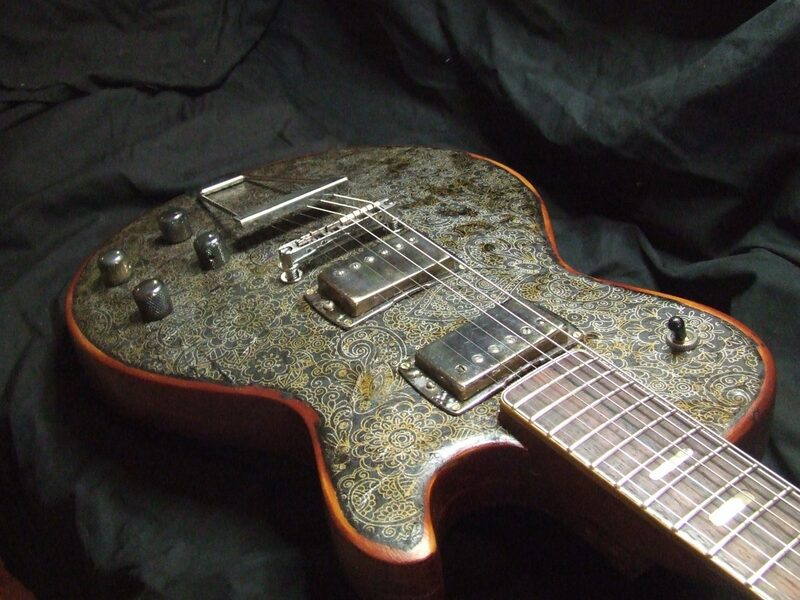 Being a Japanese LP replica with a semi hollow top, I would place it in the late ‘70’s-early 80’s. She’s probably a Kasuga, maybe a Stagg or maybe an Ibanez… take your pick. The refurb process went as follows. I had some fine Japanese Gift wrap (quite appropriate I think) so decided to give it a “distressed wallpaper” vibe. Andre over sprayed this with tinted lacquer and voila! This created a slight Zemaitis vibe. 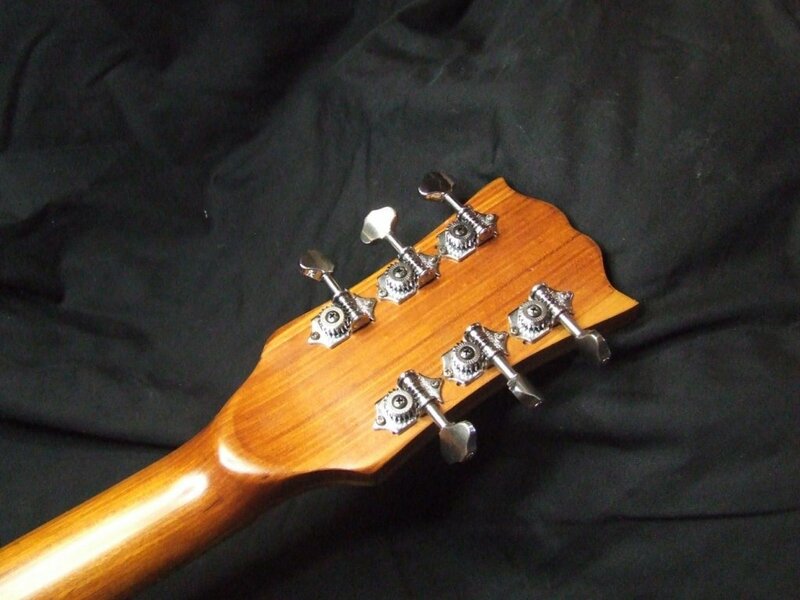 Andre restored the headstock and re fretted the neck before again over spraying in tint lacquer. 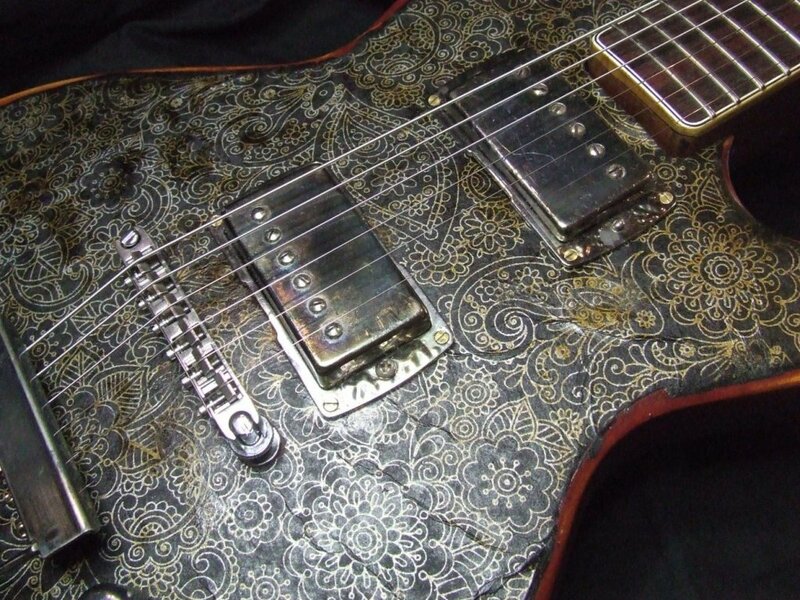 I had a Seymour Duncan “Dime time” pick up for the bridge and an 80’s Dimarzio PAF for the neck. All new electronics with the exception of two original 70’s Japanese tone controls (they have a slight squeak when turned which I think is kind of cute). 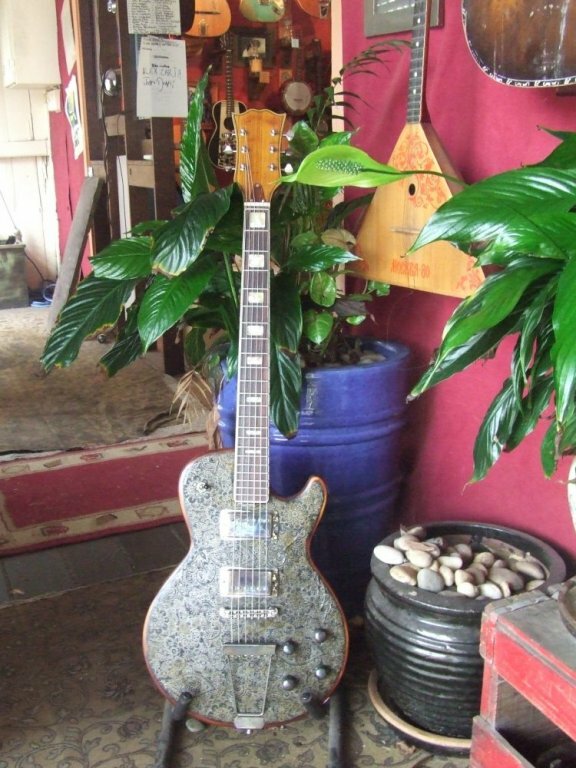 We also decided to use a trapeze tail piece which gives the guitar a lovely woody tone and I feel also gives a slight Rick Turner vibe (another fine maker). 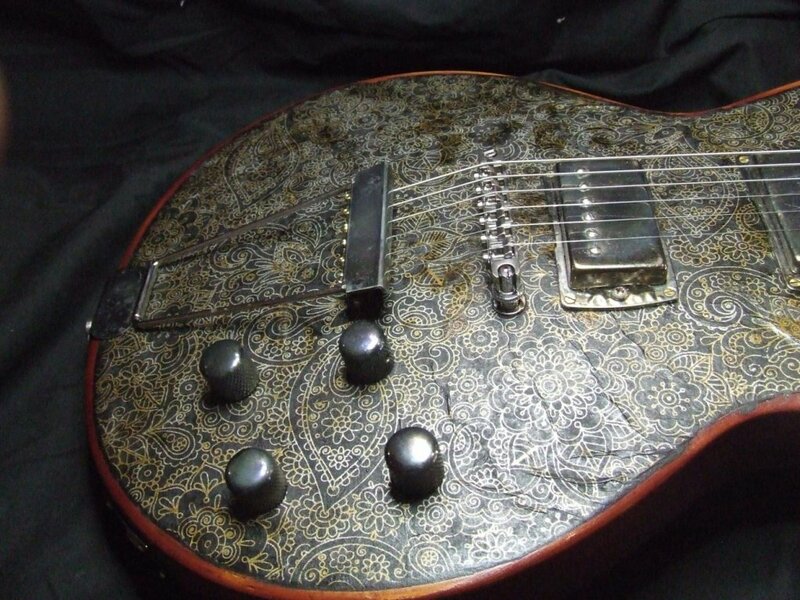 Aged parts add further to the look which all put together also gives the end product a slight vibe of Neil Young’s “Old Black”. She sounds and plays amazingly!